England head coach Phil Neville admits it’s going to be “very difficult” to cut players from the squad that beat Spain 2–1 ahead of the World Cup in June. Neville is in no rush to name his squad but he’s already suggested it will happen before England step out to face Denmark in Walsall after the domestic season has ended next month. Every player in his squad got on the pitch either against Canada or Spain, with Ellie Roebuck and Mary Earps sharing goalkeeping duties against Spain, and appearances also for the likes of Georgia Stanway and Chioma Ubogagu. “It’s going to be difficult,” said Neville. “You know it, I know it, we know it’s coming. I know how I’m going to do it, when I’m going to do it, I just don’t know who it’s going to be. He added, reflecting on his time in charge so far, “The pleasing thing for me as a coach is I’ve stuck to what I believe in — giving everyone an opportunity. Tonight wasn’t a trial at all, nobody has put themselves on the plane or taken themselves off it. Telling the two or three in this squad and the four or five on the fringes is going to be difficult. Neville made nine changes from the side that lost against Canada in Manchester on Friday and ensured every player got minutes at some point. With Izzy Christiansen’s World Cup still hanging in the balance, one goalkeeper will definitely miss out and potentially two outfield players if nobody else from the fringes makes a late play for a spot on the flight to Nice. But despite the Spain game and the performances of certain players potentially providing a headache for Neville, he’s not complaining and singled out several players for their performances both tonight and during 2019 so far. “I wanted them to play well [those coming in],” he said. Beth [Mead] did. Beth’s turned a bit of a corner, SheBelieves was a good one for her. She’s the nicest girl you’ve ever met. After Brazil, I got her in and told her she wasn’t playing against the USA and the look she gave me, she could have killed me. Neville also singled out his captain for the night, Jill Scott, who, despite having achieved well over a century of international caps, was wearing the armband from the start for the first time. Scott was cautioned in the first half for a late challenge but showed her continued importance to the team with her all-around performance, while the returning Jade Moore was also praised by Neville. 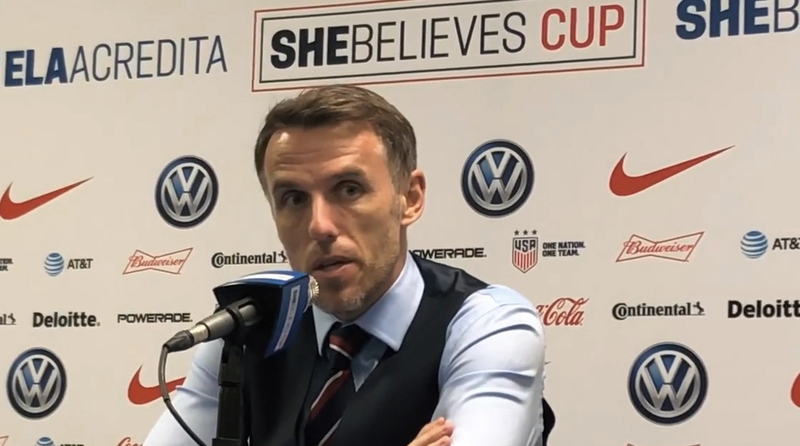 “I don’t single players out too much but I thought Jill was unbelievable,” said Neville. “In training yesterday she was sensational. We made a presentation to her before the match because Jill’s the kind of person you can take for granted. She comes in, bounces around, and keeps everyone happy. On Moore, starting just her second game under Neville after a run of injuries, the head coach said, ” I was pleased. A year ago today she played her last game [in Bosnia]. We’ve unfortunately not had her, we could have taken her to SheBelieves but we spoke to her and Reading and put her on a really good program and tonight she showed everything I wanted to see. Neville also praised his goalkeepers, both of whom played 45 minutes each. Nineteen-year-old Roebuck, who was making her first senior start on just her second cap, was relatively untroubled but dealt with what she did have to do with comfort while Mary Earps was forced into several good saves, though almost cost England the win when she came charging out for a ball in the closing minutes.